Modern electric illumination is produced by lamp technologies which can be classed according to how they produce light. There are currently four main types of lamp, and each produces light in a different manner. -The incandescent bulb which is the oldest of the electric lights and produces light by using the process of electrical resistance to heat a wire filament to extreme temperatures within a vacuum, causing the wire to emit heat as well as light radiation. -The fluorescent bulb which uses gases ignited within a tube coated with a phosphor to produce light output. -HID, or “High Intensity Discharge” lamps which use an arc to ignite a mix of gases and metallic salts within a glass bulb to produce light. -LED, which passes electricity through a small chip made of layers of semi-conducting materials to cause energy to be emitted from the chips’ surface as photons. Each of these lighting technologies works very differently from the other and as a result each has different properties which make each uniquely suited to different types of lighting applications. It can also make evaluating and comparing such lighting types difficult as well. As a result, it is best to understand some of the most basic standards regarding lighting and how it is measured and rated. Lighting types are rated according to wattage, lumen output, and efficacy. For over 130 years the incandescent bulb has been the standard form of lighting the world over. Incandescent lighting in general applications has output which is typically proportionate to the amount of power it consumes, thus most consumers equate a higher wattage light source with producing more light. However, this is inaccurate and does not reflect the actual light output of a bulb. In reality, lumen output is a more accurate way to rate lamp brightness, and it is possible for a 20 watt incandescent bulb to produce just as many lumens as a 75 watt bulb. This means, in order to really evaluate a light technology accurately it is better to note the number of lumens produced per watt, otherwise known as luminous efficacy. The higher the number of lumens produced per watt, the more efficient a light source is. This is a much more practical measure of lighting as well as it allows us to compare lighting technologies according to their useful output rather than by an arbitrary and inaccurate measure such as wattage. For instance, if we were looking to improve the energy efficiency of a residence by upgrading the lighting system, we could utilize 12 watt LED lamps producing 720 lumens instead of 60 watt incandescent bulbs also producing 720 watts, in effect drastically cutting our energy use while still producing the same amount of light. 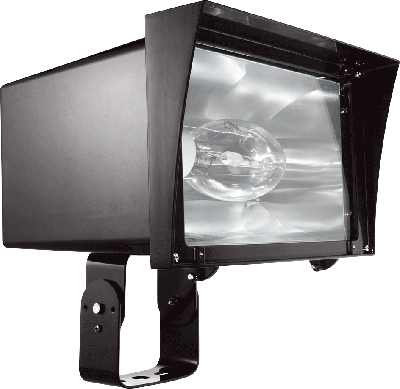 Lighting technologies are also measured by how long they will operate and how long they maintain their lumen output. This is known as service life and lumen maintenance and it tells us how long a lamp will provide acceptable output as well as how long we can expect a lamp to operate before it fails or “burns out”. Service life is an average that is based upon how long it takes 50 percent of a large enough sample to burn out or fail. Incandescent bulbs have the shortest service life of all lamps, averaging anywhere from 500 to 2500 hours depending on the bulb design. Fluorescent bulbs offer substantially longer service life, with an average on the order of 5,000 to 20,000 hours. HID offers the next highest service life average, with some bulbs lasting as long as 40,000 hours. LEDs offer the longest service life of all lighting technologies, with averages of 50,000 hours common, and ratings as high as 100,000 hours possible. This measurement can be very important in industrial and commercial lighting applications where lighting is difficult to reach and hard to service. Lumen maintenance tells us how well a lamp maintains its lumen output over its rated service life. All types of lighting experiences a drop in lumen output as the lamp ages during operation. This is an important consideration for applications where light intensity and levels are critical and need to be kept at as a high a level as possible. For instance, although an HID lamp has a high lumen per watt ratio and good service life rating, by the time it reaches half of its 30,000 hour servicelife it can have lost 50% of its lumen output. An LED lamp on the other hand can have a lumen maintenance rating of 70 to 80 percent, meaning it will still be producing up to 80 percent of its original lumen output by the time it reaches half its service life. In today’s energy conscious world, no figure is more prominent or important in lighting than system efficacy. System efficacy takes into account not only the lamp, but the accompanying hardware necessary for operation. Although the incandescent bulb requires little more than a source of electrical power, HID and fluorescent bulbs require ballasts, and LED lighting requires voltage regulating circuitry known as drivers. Since ballast and drivers can also consume electrical power as well as the lamp itself, it is important to consider the total energy consumed by the system versus lumens produced. This gives us a more accurate accounting of the actual power used to produce a specific number of lumens. For example, although an HID bulb may be rated as 250 watts, the ballast may also draw another 50 watts, thus increasing the total wattage consumed to 300 and watts and lowering the lumen per watt ratio. Candle Power and Foot Candles are two terms that are commonly interchanged, but in reality refer to different measurements of light output. Foot Candles refers to how much light reaches a surface at a specified distance and is measured in lumens per square foot. This measurement is important when we want to gauge how effectively a lamp illuminates a given area. Candle Power on the other hand refers to the intensity of light output in a specific direction, such as with the beam produced by a spotlight. This is referred to in “Candelas” and it is measured independently of any object or surface illumination. As we can see, although modern lighting appears simple enough at first glance, there are a variety of factors which determine its performance and practical use. Additionally, when we are determining which type of lighting to use for a specific application, how we evaluate lighting performance has a direct impact on how effectively lighting is utilized. By understanding these basic facets of lighting, it is then easier for us to determine which lighting will meet our requirements the most effectively.